Shawna Russell hails from Okemah, Oklahoma, the home of Woody Guthrie. And like the legendary figure, Shawna has spent a good deal of her life writing songs and traveling the roads of America performing her music. Forging a musical sound that combines Country, Rock, Folk and Americana, Shawna has built a reputation as a powerhouse singer who also knows how to play a mean slide guitar. Her music has received critical acclaim from COUNTRY WEEKLY, BILLBOARD.COM, CMA CLOSE UP, MAVERICK (UK), MUSIC ROW, ROUGHSTOCK, DREAMWEST (France), THE OKLAHOMAN, TODAY’S COUNTRY MAGAZINE, OKLAHOMA GAZETTE and others. 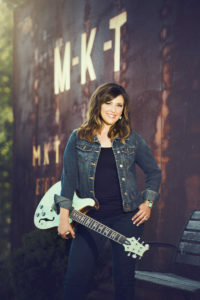 Shawna’s songs have charted in the U.S. on the Texas Music, Billboard “New and Active” and MusicRow charts, and internationally on the Hotdisc and New Christian Music charts. Shawna released her self-titled sophomore album on Way Out West Records in 2011. Recorded in Oklahoma City and Nashville, and co-produced by Julian King (Grammy-winning engineer for Faith Hill, Tim McGraw, Toby Keith), along with Clif Doyal and Tim Russell, the album reflects her growth as an artist and a maturity of her song crafting skills. Shawna’s latest project, an EP of original material entitled “Back Around”, was co-produced by Shawna, her dad, Keith and her Uncle Tim Russell. Recorded in Okfuskee County at Runnin R Ranch Studio, the organic Americana EP has received critical acclaim from music critics around the world. Shawna is now hosting “Our Land-The Music Highway” a television show exclusively on TCN “The Country Network” which broadcasts in to 60 million households nationwide. The monthly music special focuses on Americana/Texas/Red Dirt music and includes performances and interviews with the genres’ most prolific artists.